An I-Team and Troubleshooter investigation into emergency food for disaster victims found that the food is being sold online. 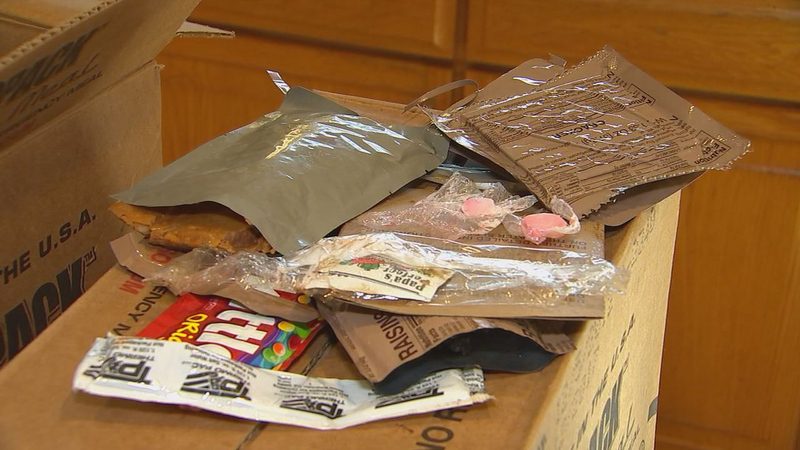 An I-Team Troubleshooter investigation into emergency food for disaster victims found that the food is being sold online. These are ready-to-eat meals, also know as MRE's. The State of North Carolina brought these meals from FEMA to help hurricane victims, and now they are being sold online. This tip came from an ABC11 viewer. 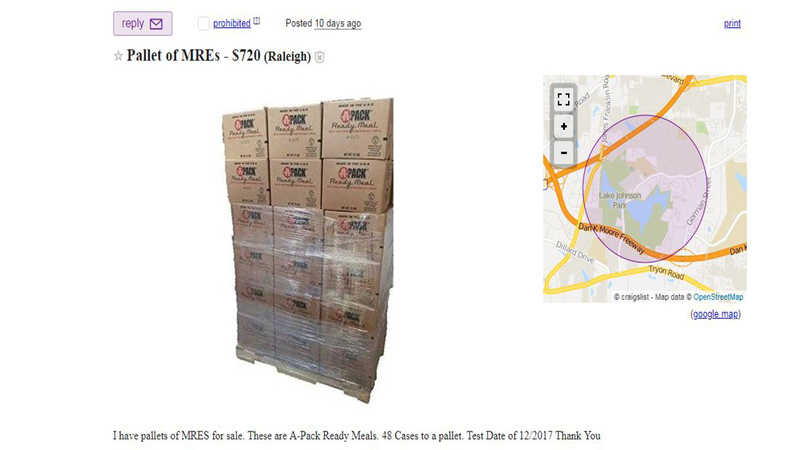 Benny Reynolds saw this ad on craigslist- fresh cases of MRE's. The ad said the meals were from FEMA and there was a surplus of food from Hurricane Florence. "I just thought to myself this is so wrong, that somebody shouldn't be making a profit off something that comes from FEMA.," Reynolds said. "There are people who are still hungry and need them." Reynolds is a retired Army veteran and after 22 years of service, he said he still buys MRE's and keeps them on hand. He responded to the ad, and the person selling the meals was William Bodenhamer III. Through emails, he said Reynolds could buy the meals out of a Raleigh warehouse, but he wouldn't be there. He said a man named Fred could help him. Reynolds bought five boxes of the MRE's, and we also went with Reynolds to try and get answers as to how these meals were advertised as FEMA MRE's from Hurricane Florence. When we got there, I showed Fred the ad posted about the emergency meals. Fred answered, "I don't know, you'd have to talk to Mr. Bodenhamer." While Bodenhamer was not there, Fred did say he just tried to call him but had no luck getting a hold of him. When I asked further about how the ad states these meals could be from Hurricane Florence Fred said, "He bought them before Hurricane Florence hit. I see what his ad says, but he bought them before Florence." Fred said he knows Bodenhamer bought them from state surplus. 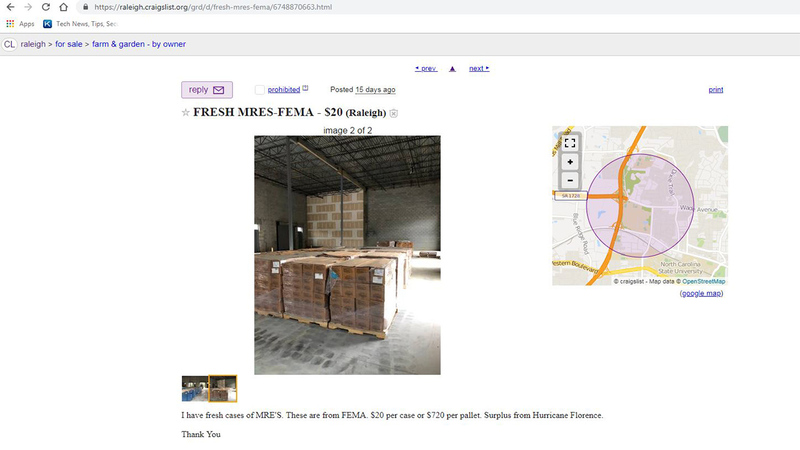 With that information, I reached out to the state and confirmed they did indeed sell 122 pallets of FEMA emergency meals to Bodenhamer in June 2018. At state surplus, he paid $7,300 for the meals. We also discovered these meals were meant for hurricane victims, not from Florence, but instead Matthew, from back in 2016. Mike Sprayberry, the Director of the NC Emergency Management, said one reason for selling the meals is money. "We are trying to be as responsible as we can with tax dollars, and we know we can get some amount of money surplusing," he added. Besides selling pallets of MRE's to Bodenhamer, the state sold an additional 206 pallets on MRE's from Hurricane Matthew at surplus. In all, the state recouped $56,428 in selling the meals. In addition to the money, Sprayberry said the main reason the boxed meals were sold is that they were beyond their five-year shelf life. "We don't want to provide expired meals to disaster survivors. I don't want to take the chance of maybe someone getting sick from an expired meal," he said. During Hurricane Matthew, the state bought these meals from FEMA and then sent them to different counties in need, and what they didn't use, Sprayberry said the counties eventually shipped back to the state. "Once they leave out of our warehouse, and you don't know where they have been stored and how long they have been kept out of the heat. I'm not willing to put people in danger and make them sick," Sprayberry said. While he doesn't want to chance disaster victims getting sick, Sprayberry is ok with the state selling them to the public. "Some people don't mind eating food that is past the expiration date that is on the label, but myself as an agency director for emergency management we certainly don't want to be providing food that is past the expiration date," said Sprayberry. After we told Reynolds these meals weren't from Hurricane Florence, but instead Hurricane Matthew, he said that made sense. He showed us one of the boxes he had already opened. In many of the sealed meals, you could visibly see something leaked inside. "You can tell it was in too much heat," Reynolds added. "The heater wouldn't work. When this is done it's supposed to be the consistency of a normal beef stew, it didn't go away from this consistency." 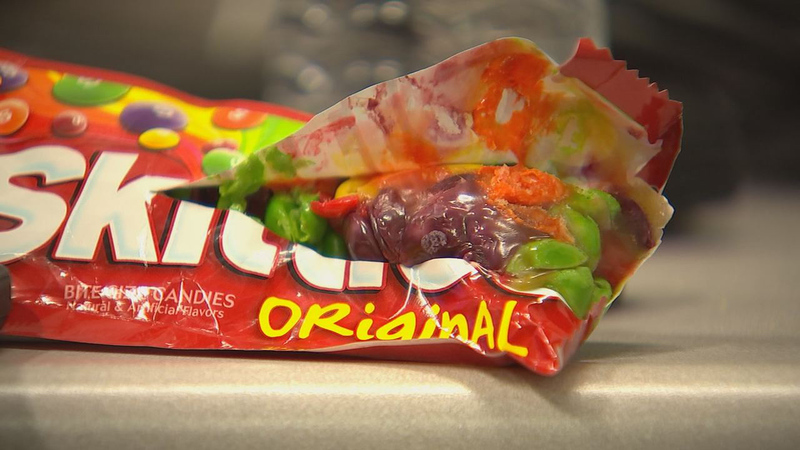 Candy was included in each MRE packages, and with every meal, the skittles we opened were all melted together and as hard a rock. "That just tells you they weren't stored right," Reynolds said. I left several messages for Bodenhamer, but he did not get back to me. He did originally take down the ad he had posted on craigslist, but we just spotted a different ad back up. When we responded to this ad, Bodenhamer responded via email and this time when we asked how the meals were stored, he wrote, "Stored in a Warehouse. Were climate controlled before we got them about 90 days ago. Test date is 12/2017. Packed a couple years before that. We have more than we have room for and blowing them out. Have sold over 100 pallets with no complaints." The best advice it's always buyer beware no matter what you are buying.